structure was finally demolished and removed on 22nd August. 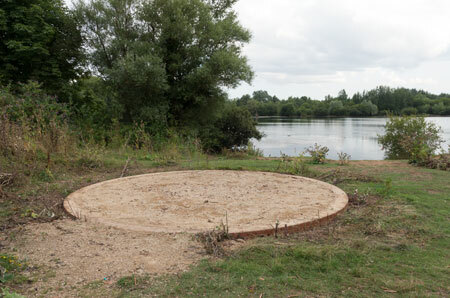 Following a series of serious attacks by vandals between March and August 2013, culminating in it being set on fire in two places on the 11th of August, the Lily Shelter at Thrupp Lake has been demolished. It had been hoped to rescue the major part of the structure so that it could be re-erected at a later date, but the fires had badly damaged two of the main structural supports making this impossible. The salvaged timber has therefore gone for recycling and the shelter is now gone for good. The Lily Shelter, a community build project, was erected during 2010 with the purpose of providing shelter for visitors and volunteer workers. It’s unique design and “sustainable” contruction, which were part of its attraction, were also its downfall. Being constructed more or less entirely of wood and being somewhat fragile, it was always vulnerable to vandalism. It was hoped that anyone using it would enjoy and value it enough to not be stupid enough to want to damage or destroy it. Sadly this was not the case and the facilities it offered have now been lost to all, not to mention a unique architectural feature that had become part of the landscape. Those who perpetrated these acts have brought shame, not only onto themselves, but also onto the community of which they are a part and have caused great sadness among those who have worked so hard to save the Radley Lakes and those whose efforts contributed directly to the building of the shelter. If you witnessed these acts of vandalism or any other criminal activity in this area, please contact the Police, or Crimestoppers on 0800 555 111. To see the shelter during construction in 2010, and just after completion in 2011 see the 2010 and 2011 entries on the Radley Community Days at Thrupp Lake page.